The 2018 Midseason Invitational comes to a close this weekend, marking about the halfway point in the competitive League of Legends season. While Korea’s Kingzone takes on China’s Royal Never Give Up, the rest of the weekend will be packed with a variety of events as well. There are a ton of fighting game events, some Siege finals, and the Overwatch League keeps on keepin’ on. Here’s what is going down in the wide, wide world of esports this weekend. The LCK and LPL clash tomorrow, with the pre-show starting at 11:30 a.m. CEST—5:30 a.m. ET here in the states. It will be a best-of-five so don’t worry, even if you miss your alarm you can probably catch the tail end of the series. Check it out over on the Riot Games Twitch channel. The first week of stage 4 comes to a close. There’s been some Brigitte and Zarya, some surprising outcomes, and still Shanghai is winless. Damn. See if they can change that in their match against the Los Angeles Valiant today, after Philly and Florida kick the day’s action off at 4:00 p.m. ET over on the Overwatch League Twitch channel. Pro League Season 7 comes to a close this weekend, where eight teams will fight it out in Atlantic City for the big title. Quarterfinals start today, while tomorrow sees semis and grand finals, as well as some reveals for the upcoming Operation Para Bellum. Check the schedule here for times, and follow the action on the Rainbow Six Twitch channel. The Smash community heads to Ontario this weekend for Get On My Level 2018, and a significant amount of talent will be in attendance for both Melee and Smash 4. Check the Smash.gg page for tournament schedule and brackets, and head over to EvenMatchupGaming’s Twitch channel for the action already underway today. There’s a lot this weekend, so let’s just run it down quick. 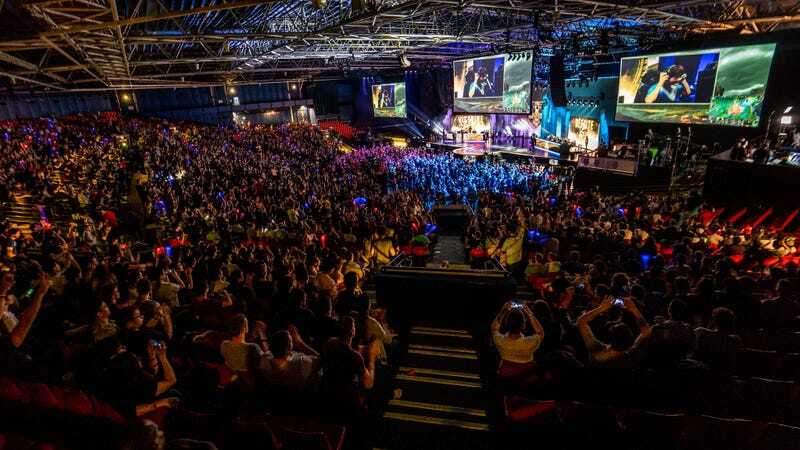 Stunfest 2018 is underway in Rennes, on the Stunfest Twitch channel, for games like Street Fighter V and Dragon Ball FighterZ. Battle Arena Melbourne keeps running as well over on the Couch Warriors Twitch channel. In Toronto, Toryuken 7 hosts the usual fighting game suspects as well as a few oldies like Garou: Mark Of The Wolves on the Toronto Top Tiers channel. And in Seattle, qualifiers for the Red Bull Conquest tour get going at 3:00 p.m. ET on the Red Bull channel. Check out all the linked Smash.gg pages for exact schedules and brackets, and happy brawling! The MDL Changsha Major comes to a close this weekend, where Vici Gaming J Storm will try to close out its winner’s bracket run after taking down sister team Vici Gaming. But in the loser’s bracket, PSG.LGD climbed out from the heap and has been knocking off teams left and right. The next International is getting closer every day and points from a major could make a big difference for some of these teams. Find out who wins it all starting at 1:00 a.m. tonight on Beyond The Summit’s English stream of the action. Did we miss anything? Wanna shout out a local tournament? Can one truly ever get on another’s level? Let us know in the comments!